Android may be catching up fast, but it was the iPad that made the tablet a must-have piece of kit for any self-respecting gadget aficionado. For the while, at least, the iPad continues to lead the charge and, though its games, web browsing and playing about on Facebook and Twitter are as popular as ever; it’s also managed to infiltrate the music industry. We’re not just talking about the fact that the tablet can house your entire iTunes music library. It’s also fast becoming a useful tool for musical types, both professional and amateur. The most high-profile use of Apple’s tablet by a pro musician so far involves the latest album from ex-Blur frontman Damon Albarn’s hip-hop project Gorillaz, which was created largely on his iPad during a 32-day tour of North America. The album uses real instruments and vocals combined with a good helping of synthesizers with Albarn making use of around 20 apps including Korg iELECTRIBE, Moog Filatron and FunkBox Drum Machine. 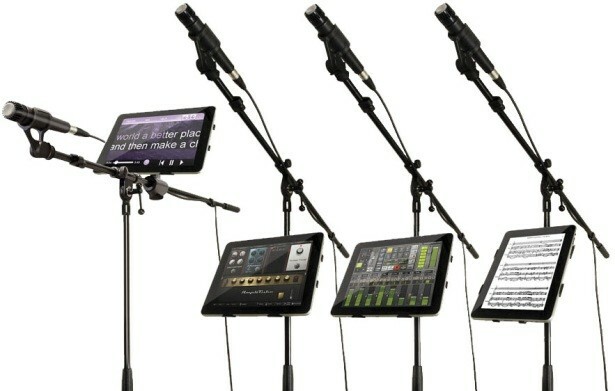 It perfectly illustrates the convenience of being able to lay down tracks on a device, while on the move, with no access to a desktop computer or studio. Convenience and portability are obviously two great benefits, especially, as with Albarn, plenty of musicians spend a great deal of time on the road; however the bonus of using a tablet goes further than that, as accessory brand Griffin’s PR director, Jackie Ballinger, told us. “Technology, like the iPad enables musicians to become mobile without losing quality, now people are able to make music anywhere without limitations and without substantial costs. Money appears to be one of the most important factors – not exactly shocking when you consider the huge cost involved in putting an album together. If an artist can record an album for less, then why not? The cost of producing a chart album is estimated to be a whopping £250,000, so it’s hardly surprising that musicians are opting for a more affordable route, especially those who don’t have a record deal and are producing the work themselves. Two-piece US indie band The Ultramods managed to produce an entire album (entitled Underwear Party) in just 2 weeks, only using GarageBand for iPad. You can read the rest of the article here on Pocket-lint.com (originally published 12/09/11).